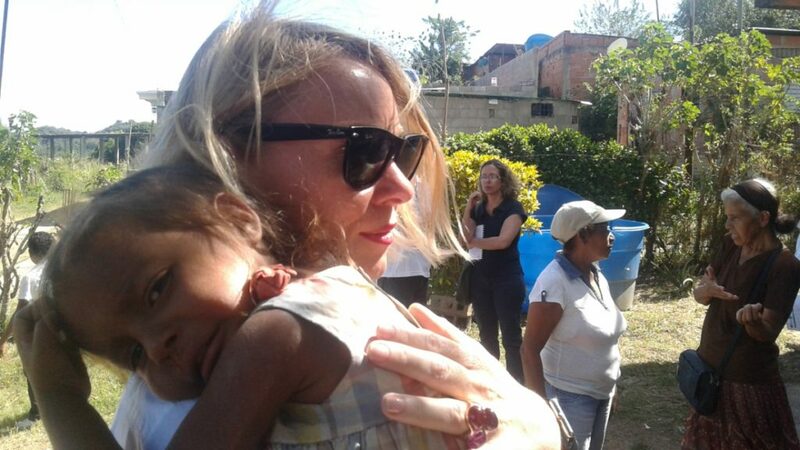 I first saw her at a Caritas Venezuela malnutrition screening of hungry mothers and hungrier children in Santa Lucia. Health workers weighed children, checked their height, measured the shrinking circumferences of their bony arms, while she sat listlessly. A whisper of a child, at 4-years old, Angelys weighed no more than 9 kilos (18 pounds) the same as her two-year-old sister, Barbara. With a fragile and exhausted cry, Angelys said repeatedly the word “mango” while touching her head. Confused, I approached her and took her in my arms to soothe her. “Mango, mango, mango,” she whimpered in a voice devoid of strength. I saw she had lost patches of hair and her body was covered in edemas, both signs of acute malnutrition. Her mother informed us that she was asking for more mango— the last thing she’d eaten more than two days before. As I held Angelys, I thought of other four-year-olds I know, their doughy cheeks, their penchant for mischief, their spontaneous laughter. I thought of other emergencies where I’d worked, the refugee camps, the tent cities and how even in those circumstances the children would come up to me for makeshift games of hide-and-seek or peek-a-boo. Across Venezuela galloping inflation reached 2,735 percent in December 2017,according to the Venezuelan parliament. Salaries that once covered a household’s basic needs are no longer enough to cover the cost of feeding a family. A kilo of flour, when it can be found, can cost up to a week’s salary. The impact can be seen in the hollowed out waistlines of most Venezuelans — in the past year alone, three out of four lost an average of 9 kilos (19 pounds). While the scales keep registering lower and lower weights, the only thing that seems to be on the rise is the number of people living in poverty— 82 percent of the population. Each month the number of cases Caritas registers of childhood under-nutrition creeps up. More than two-thirds of the children examined showed signs of malnutrition, and sadly, severe cases like Angelys are not unusual. As head of the Caritas Internationalis Humanitarian Response Department, I was familiar with the statistics. What I wasn’t prepared for was the gravity of their impact. I rocked Angelys, her ruffled shirt billowing around her tiny frame. “Mango, mango, mango,” she repeated and cupped her head. She and her sister were both admitted that afternoon for therapeutic feeding—a small reprieve for their desperate mother who could now focus on feeding her other three children. Throughout my visit, it felt as if everything I touched was somehow crumbling. Not only were the shelves at grocery stores bare, but hospital shelves were also barren of needed medical supplies. Lack of pharmaceutical products has led to a resurgence of diseases long ago eradicated in Venezuela: malaria, diphtheria, and tuberculosis. Families too depleted to purchase food will hardly spend their resources on a bar of soap, perhaps one of the best defenses against the spread of disease. Unfortunately, these same families are at increased risk of falling ill due to poor nutrition. 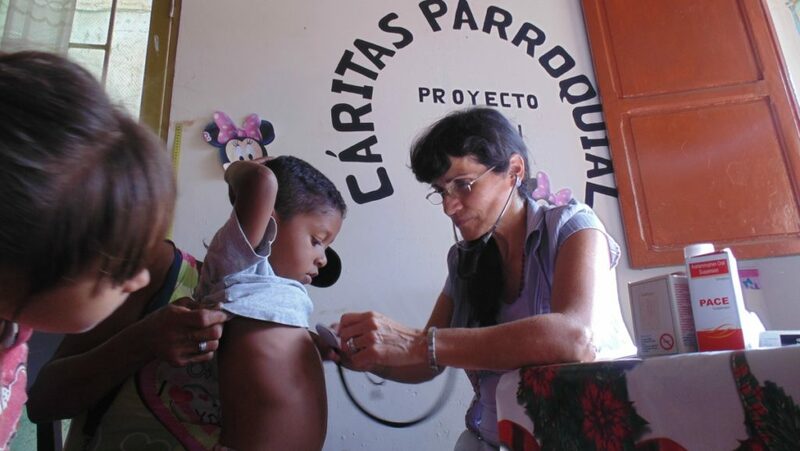 Caritas Venezuela is working to alleviate suffering. 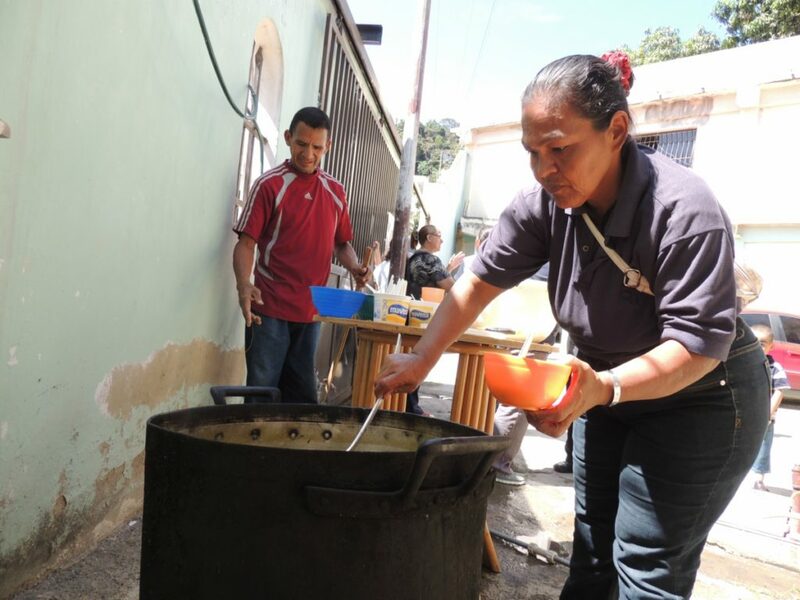 I saw it in the steaming bowls of hand-cooked meals lovingly served at the ollas comunitarias (communal soup kitchens) operating at more than 400 parishes. I saw it in the compassionate care health monitors weighed and registered children. I saw it in the determined struggle of Caritas staff to organise medical missions and work to maintain a minimum stock of medication at parish health centres. With each act of compassion the Church is not only nourishing bodies, they’re nourishing hope. Despite hardships Venezuelans have a palpable desire to help one another. In the past seven months, the number of Caritas volunteers doubled from 10,000 to 20,000. While people may be food starved and cash-strapped their overwhelming drive to tithe their time is remarkable. I departed with a mix of emotions. Usually, I can set aside my feelings after visiting an emergency zone, but not this time. Venezuela is not at war. Venezuela has not been hit by a natural disaster. In a middle-income country with high-rise panoramas and an abundance of oil, widespread hunger should not be the norm. We know what needs to be done to alleviate the suffering; food assistance, medical care, water, sanitation and hygiene campaigns. What we lack is access. Even in countries like Syria and South Sudan, we can get life-saving care to those who need it. We should accept no less for our Venezuelan brothers and sisters. My hope for Venezuela has not abandoned me. I take heart in each volunteer who despite their challenges come forward to help their fellow man. I take heart in the Caritas staff, who often work with their own belly’s grumbling. And I take heart in a video I received last week of Angelys. Her haunting plea for a mango replaced by a full-bellied laugh and a shy little smile typical of girls her age. I watched the video over and over again. We managed to pull this little girl from the grips of death and return her childhood. We need to continue this work.